Th Nights: 7pm - ? Nights : To be checked ??? 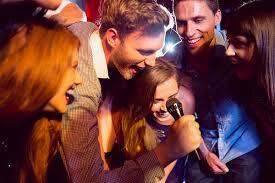 Karaoke Bar Sydney Venues Guarantee Plenty of FUN for Everyone! Karaoke Bar Sydney means one thing— plenty of FUN! Belting out your favorite tunes at a friendly karaoke pub or bar is a fabulous way to meet new people. Karaoke is no longer a novelty in Sydney town (or anywhere for that matter) but has transformed into a popular alternative to the customary pub and club scene. People everywhere are discovering that they truly enjoy the karaoke experience. Looking for a karaoke Sydney bar in and around Sydney Parramatta Hills and Sydney Outer Western suburbs is easy here on Find a Karaoke. Penrith karaoke gets it’s groove on every Thursday evening at Castle Hill Tavern, Northmead Bowling Club rocks it out on Friday nights and Lalor Park Hotel has karaoke happening on Saturday nights! Check below for our up to date karaoke bar Sydney listings. The listings are easy to navigate with some venues being listed on multiple pages due to their close proximity to more than one region.